More footage from the recent 40th Anniversary event held in London, featuring the talented Amy True with a couple of BBoys doing their thing! ‘Traveling Man’ is the latest release from the continuously creative Harn SOLO, is more than just a title. SOLO’s eleventh creative endeavor, ‘Traveling Man’ tells the tale of a young music fan from Southern California that chased his dreams to New Orleans before stopping in his current locale of Denver. Those familiar with the past releases from Harn SOLO will not be disappointed to see imaginative boundaries continued to be pushed; something that is lacking in today’s mainstream music. 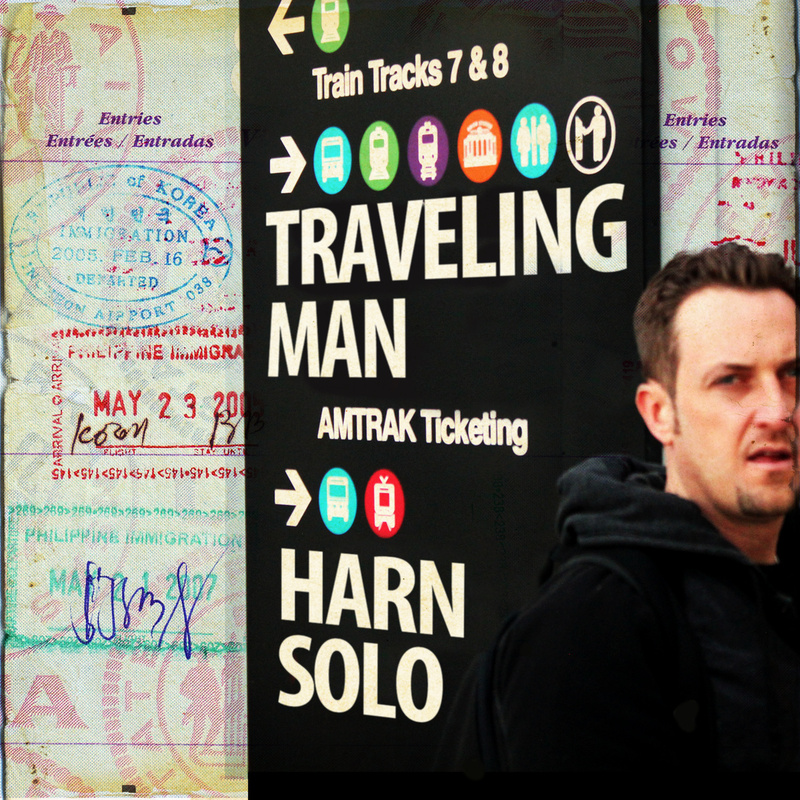 More than a rapper, but rather an artist, Harn SOLO has added another masterpiece to his collection with ‘Traveling Man’. After his recent relocation from New Orleans to Denver, Harn linked up with recording engineer Jonathan Klein to document the experience. Assisting with the overall transportation theme, Traveling Man features airplane and train audio clips handpicked from creative partner Caliobzvr. The graphic design for the release was conceptualized by Elespee of Guerilla Publishing Company in NYC. The magnum opus of Harn SOLO’s assortment of works, ‘Traveling Man’ Is available for download now on Soundcloud and Audiomack as well as here on bandcamp…. The self titled track from ‘The Coup’ album from West Midlands, UK emcee Jose Cifuentes aka Utopia The Mapuche of the Broken Dialect Collective. It would not be an overstatement to say claim Yasiin Bey as being one of the most prolific visionaries. While many were first exposed to him as the rapper Mos Def, few realize that Bey had his start in show business as a child actor – which contributes to his ceaseless passion and experience on-screen. On top of these two professions, the Brooklyn-native has also made noise on the social and political tip, on which we have been taking notice of for a more than a decade now. In accordance with the celebrations occurring across the globe, HIP HOP HONOURS UK in conjunction with Westway Presents will be hosting a ‘40yrs of HIP HOP CULTURE CELEBRATION’ on THURSDAY 11th DECEMBER 2014 at THE FLYOVER, Portobello, London W10. This event will be made up of solely live music & art performances, spanning 2 generations and all of the elements of Hip Hop Culture. Old-skool, mid-skool and new-wave artists will be in participation: DJs displaying the skillset of a turntablist, B-boys, poppers & lockers, rap performances, a live paint/write by graffiti artists. This display of the whole culture will stand side by side with speeches from legends/elders, interviews, and the screening of the History of Hip Hop Culture. This event will be hosted by T J Chill (Zulu Nation), records will be spun on the night by legendary hip hop DJ MK, DJ Kuku and DJ Harry Love with special appearances by previous awards honouree Rodney P, PowerLords and many more artists, plus special guests. DJ Jam Fu will lead the B-Boy/ B-Girl open cypher. The coverage of the event highlights will be broadcast on an online video channel at later date. © 2014 Hip Hop Honours UK. All rights reserved. Taisuke takes on Menno in the FINAL BATTLE of the Red Bull BC One World Finals in Paris. Afrika Bambaataa rocking the crowd on the decks at the recent Universal Zulu Nation Anniversary of Hip Hop culture held in London.